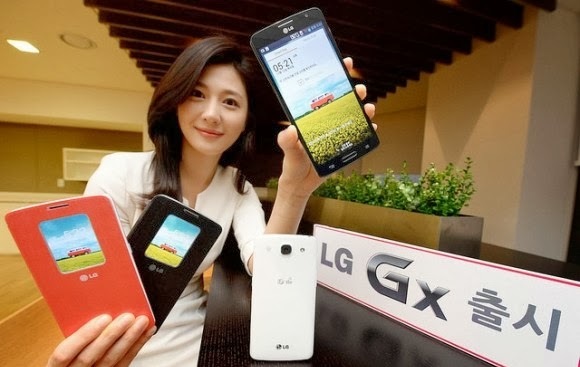 LG recently announced and made official the LG GX Android Smartphone in South Korea. This is a massive Android Jellybean handset with the screen measuring 5.5-inch, with that big display you will not be disappointed to know that it sports a 1080p display or Full HD IPS Display. Not just bigger but clearest display for a more-than-five-incher-smartphone. If you are familiar with LG's line of Android smartphones, especially the recent ones this year, you will find out that the Gx is a refreshed version of the Optimus G Pro bearing the same technical specifications with some additions. The LG Gx is powered by a Qualcomm Snapdragon 600 chipset paired with a 2GB of RAM. This 167-gram handset measures 150.6 x 76.1 x 9.2 mm and is equipped with a 32GB internal memory space. It packs a 13MP back camera and a 1.3MP front camera. For connectivity options there are LTE/HSPA/EV-DO , Bluetooth 4.0, USB 2.0 and NFC. And of course the common LG apps are also present in the new LG Gx such as KnockOn, Pause, QRemote, Smart Memo Smart Day, Media Time and man more. All of these will be enclosed in either black or white color chassis. As for its availability, it is more likely to be rolled out early next year right after the annual Consumer Electronics Show or CES 2014. There a website that said this device will be sold for around $800, that's too much for a smartphone right? But that calculation was converted from its Korean price, we do not know if the price will be official or it will be little bit lower than that.